Port Angeles, Washington. 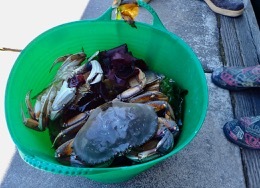 Dungeness crabs, just caught by our friendly neighbors Kurt and Donna at Boat Haven Marina. Shaken and stirred from the square current vs wind waves from San Juan Island to Port Angeles, docking took us two shaky passes into Port Angeles' Boat Haven Marina. "Take whichever slip looks better, P29 or 31, then let me know where you land" Jerry told us when we called in. 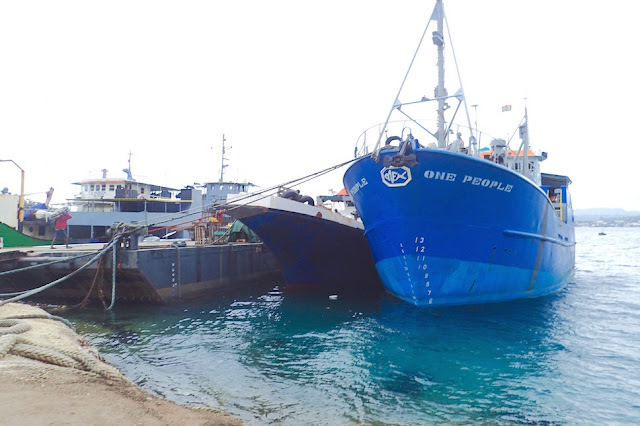 We bailed on our first choice slip because we couldn't tell if there was sufficient room to share the slip with the decrepit pilot house fishing boat, as its tarp cover ballooned in size with a fluttering gray. On our second try, Serendipity's bow tapped the pilot house boat's dinghy, protruding off the adjacent dock finger. Kurt agrees to pose to show off part of his catch. Boat Haven, Port Angeles, Washington. On this cool gray morning, we looked up at a row of corrugated of boat garages, a patchwork of jagged metal, fraying fiberglass and unfinished wood. Clearly not on the guest dock, we wondered just what kind of place we'd arrived at. A few minutes later we noticed a couple peering into our boat. Admittedly at that moment I was not feeling particularly friendly, but their curiosity overcame my crankiness. 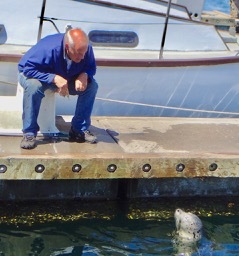 Thus began a series of correcting my mis-perceptions about the denizens of Port Angeles Boat Haven. 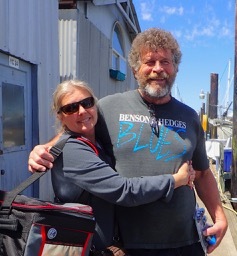 Kurt and Donna, just part of the incredible boating community at Port Angeles Boat Haven Marina. First there was Kurt and Donna -- the curious couple. They moved up to the area after retirement from Salinas, exchanging their California home for a home, a boat, a boat house (water garage for a boat) and a big truck. Their boat house was a stone's throw from our slip and a cousin to their trawler. We invited them aboard to scope it out -- boat owners like checking out boats similar to their own in almost the same way same species dogs give each other's butts a friendly tip-to-tail whiff. From there Kurt and Donna gave me a lift to the distant marina office for a gate key, a quick tour of the town in their truck, plopped a quarter into my hand for the shower and offered to take us crabbing the next day. We already had plans to join friends Robyn and Marc, cruisers who chase perennial summer by bouncing between Whangarei New Zealand and property in Squim Washington USA. We last Robyn and Marc them about nine months prior in New Caledonia. 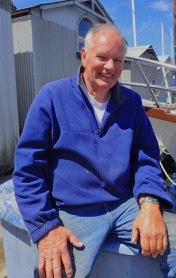 Cal, a live-aboard on a sailboat next door to "our" slip at Boat Haven Marina. "No need to plan dinner!" 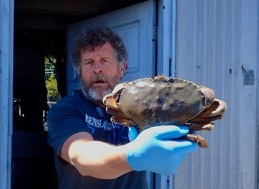 was the cheery text subject line accompanied by a gorgeous Dungeness crab picture. Clearly, Donna and Kurt scored, as there were several takers for their crab catch before we were in line for one. In fact, they landed 9 crabs, each as beautiful as the next. We read their text whilst chomping down on a generous brunch at the equally friendly Empossible Eden Cafe, heartily recommended by Kurt and Donna. 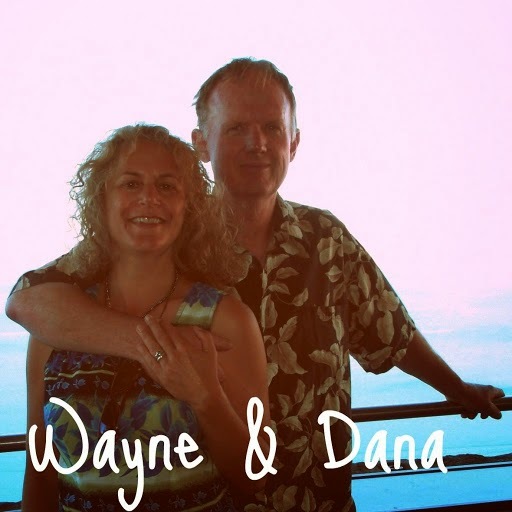 One of the waitresses raced out into the cafe parking lot as Wayne nearly pulled away without his hat. "Err, we don't have anything big enough to boil them in," we lamely confessed, when Kurt proffered us some of their beautiful freshly-caught crabs. We're still in the process of setting up our galley, and planned to wait until we arrived in Portland to complete the process. While Donna scrambled for a large enough boiling pot, Kurt tracked down a two live-aboards -- spry 93-year-old Elmer and his fishing buddy Cal. Cal set us up his crab boiler - on the spot. That way we didn't need to make arrangements return Donna's pot after they headed home. Meanwhile, Kurt grabbed his bucket of crabs, home-made mallet, knife and cooler and set off to the dock's fish cleaning station. JulieAnne, from Forks, crabs she caught skittering in her kayak. She and her brother visit her Gram at Boat Haven. There, we chatted with JulieAnne, the adorable and fish-savvy grand-daughter of marina resident Julie. 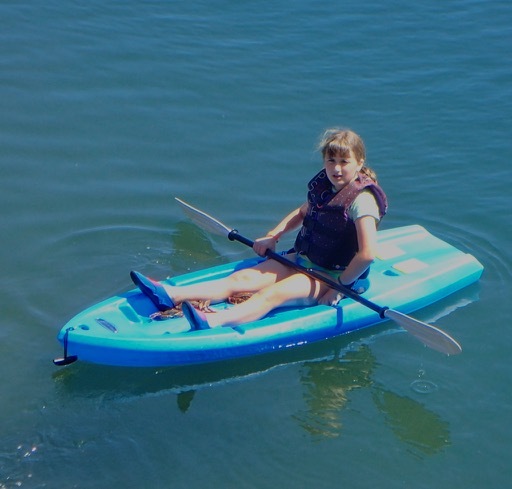 JulieAnn alternated from the docks to her kayak, netting minnows for crabs, catching crabs for the feeding herself or some of the marina's other non-human locals. Meanwhile, quick as a wink, Kurt got to work -- all 9 crabs were split with a mallet, rinsed, stripped of their carapace, gills, tails and "butter" and rinsed again. Kurt gave us two crabs. 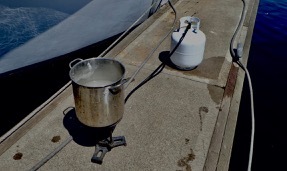 Cal's crab cooker set-up. Boat Have Marina, Port Townsend. Cal's propane tank and stand with huge seawater-filled pot atop it was boiling for us when we returned. "How long do they cook?" we asked Cal, then had a hard time tracking the twelve minutes Cal told us it would take as we were so handily entertained by his feeding pregnant lady Waldo the sea lion and her mate, Archie. 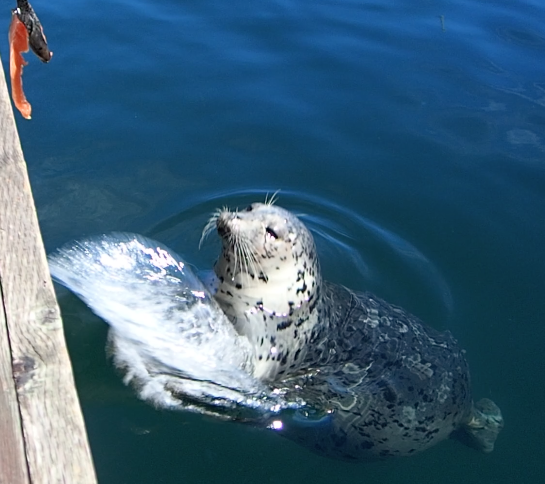 Cal fed them fish scraps, enticing them to first splash-clap for them, then pull them off the dock or from his hand, when he didn't drop them directly in the water. 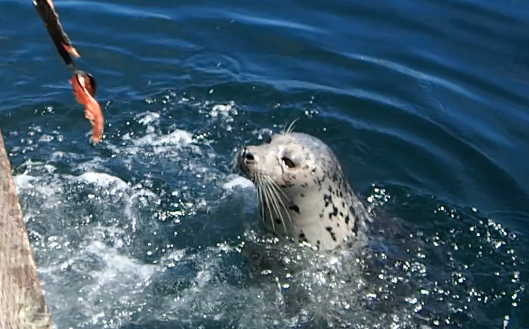 Lady Waldo the sea lion drops by Cal, who she knows has a soft touch for her and her mate Archie. Port Angeles, North Puget Sound. "These will be the best crab you've ever eaten, promised Cal. We're looking forward to proving him right; even brought along cocktail sauce in the hopes of some crabby serendipity; just didn't expect them and the use of a to boiling pot to be part of our Port Angeles adventure. Cal explains to Waldo what he expects from her in order to be fed. Waldo eyes Cal's fish offering with great interest. Port Angeles, Washington. It took far less time for Kurt to clean 9 crabs and Cal to cook them than for us than for this post to be written! "Are you sure you don't want to just take the next year off?" Wayne asked, plaintively. Tough call, but we gotta get to work so we can be in a position to pay forward all this incredible kindness. It's a tough act to follow; we hope we're up to it. Come to Port Angeles. For a mere $1/foot, you'll find about the friendliest folks ever and all sorts of delightfully unexpected entertainment. both Waldo and Archie got plenty of eats from Cal! We're in Port Angeles, Washington, N48.07.575 W123.27.272. Tomorrow, all too soon, we plan to head South toward Portland, where we'll dock Serendipity. We're tentatively planning to start at oh-barely-light-hundred to hug the shore on the way to to our probable next stop, Neah Bay, 50-something miles toward Portland. 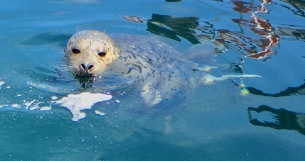 Watch for more posts on our short but sweet time in the San Juans as well as more on Serendipity.